Hudson Valley Restaurants & dining, Zagat Rated, Green Certifed Ellenville, Aroma Thyme Bistro: Even The Little Guys up North are Getting Laid Off!!! Even The Little Guys up North are Getting Laid Off!!! North Pole- It’s hard to believe that Santa’s helpers, the elves, are losing their jobs this season. “We just aren’t that busy”, says the master gift giver, Santa. “When you don’t have orders to fill, it is tough to watch my little guys stand around all day. They might as well just take a sabbatical”. Santa claims he still has work to be done, but on a much smaller scale. The Holiday Gift Institute (HGI) is trying to figure it all out. They are a research group that is funded by the big department stores. 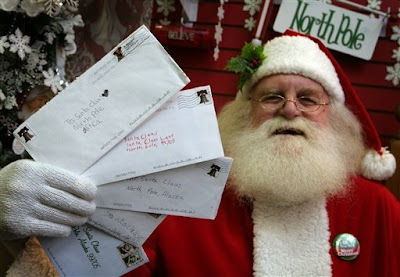 Phree pointed out that Santa was getting way too many requests for gift certificates to their favorite restaurant. Santa and Phree then went on to look at Aroma Thyme’s website, www.aromathymebistro.com. These two went on for an hour about what they wanted to eat. Santa wants the 46oz Cowboy & Chocolate Torte. Mrs. Clause told Santa to get her the Wild Salmon, Pear & Romaine Salad with the Pecan Mousse Pie. Phree pointed out the Free-Range Buffalo Wings, Kobe Burgers, Local Cheese Plate & eco-friendly Albacore Tuna. Santa added that whole restaurant is Certified Green. All agree that this restaurant is one of the most eco-friendly restaurants when it comes to cuisine. Upon further research Phree found out that Aroma Thyme is giving out FREE gift certificates this holiday season. Aroma Thyme is giving you a FREE $25 gift certificate when you purchase $100 in any combination. And a FREE $10 on any combo of $50.